Recover a Blessing Stone in order to prevent a cosmic catastrophe. 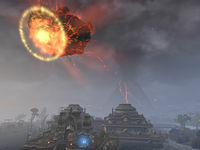 Baar Dau is falling, Red Mountain is erupting... Lord Vivec needs your help! The Daedric hound Barbas tricked us into depleting Lord Vivec's energy so he could determine the location of Clockwork City. Before we deal with Barbas, we need to restore enough energy to Vivec to keep the moonlet from plummeting out of the sky. Talk to Canon Llevule in Vivec's Palace. Find Overseer Shiralas in the Construction Site. Retrieve the Blessing Stone from the Third Canton. After you finish talking to Vivec at the end of Divine Intervention, Canon Llevule enters the chamber asking what happened to the archcanon. Talking to him starts this quest. "By the three, Lord Vivec looks terrible! Where's Archcanon Tarvus? He always seems to know what to do in situations like this." The Archcanon is really Barbas. He tricked us all and now Vivec's energy is nearly depleted. My gods, all of Vvardenfell is in danger!" "If only there was a way to give Lord Vivec some energy-wait, that's it! A Blessing Stone! Find the Overseer and retrieve another stone from the construction site. Oh please, hurry! I've never seen Lord Vivec in such a desperate state!" I'll talk to the Overseer and get another Blessing Stone. "I expect the Overseer's out near the unfinished cantons, watching out for looters. When people panic, they're capable of anything. With all the chaos going on outside, the Overseer closed the construction site." Canon Llevule says he will make the preparations to return the power in the Blessing Stone to Lord Vivec. As you climb the stairs to exit Vivec's Private Chamber, you can hear rumbling and explosions from outside. Once you exit the palace, you can see Red Mountain erupting and the moonlet getting dangerously low in the sky. Head towards the construction site you visited in Divine Conundrum. As you travel through the city, flaming rocks will fall out of the sky, and you can hear the sounds of people panicking. Near the construction site, on the St. Delyn Canton, you find Varona Beloren. Talk to her to find out where the Overseer is. Walking to the bridge to the construction site, you'll encounter two workers. One yells for the other to "Get out of there!" as the other comes running across the bridge. You can talk to the runner, Thaleft, after he's safely across the bridge, or you can just go straight to searching the site yourself. "We barely got out of there alive! I can't believe the Overseer's still in there. What's she going to do when the canton sinks into the bay?" The Overseer's still at the construction site? "Yes. The overseer ran in there when she saw the looters. We tried to follow, but then the moonlet began raining fire, ash, and chunks of rock. Last I saw, she was chasing the looters into the far canton." Why would the looters risk their own livers? "Greed is a powerful motivator.We left tools and materials just sitting around, unprotected, when the priests ordered everyone to get off the streets. The looters happily risk their lives if there's a profit to be made." Once you have gone over the bridge, go to the right to find a door into the construction site. All other ways in have been boarded up or blocked off at this point, so this is the only way. Make your way through the site, fighting looters as necessary, until you find Overseer Shiralas. She is fighting a looter when you find her, but she quickly kills him. "Another looter? You want a taste of my steel, too? No, wait - I remember you. You borrowed one of our Blessing Stones. Well, the Archcanon returned it after Lord Vivec was finished with it, so no need to fret about that." Lord Vivec needs to borrow the Blessing Stone again. "That's impossible. We installed the Blessing Stone back in its canton and finished construction on that section a short time ago. Wait a moment-does this have something to do with chunks of rock raining down on the city?" Let's just say it's vital that I get a Blessing Stone for Lord Vivec. "I suppose you're in luck, then. We happen to have another Blessing Stone. It's at the third canton. Here. This key will open the door to that portion of the construction site. Just watch out for looters-and the rocks falling out of the sky." I met your wife. She's worried about you. "Varona? Was she still angry with me? No, you don't have to answer that. I know my wife. I'll head back and let her know I'm all right. Tell Lord Vivec he can have our Blessing Stone-as long as he promises to do something about Baar Dau." The Overseer gives you the Third Canton Key. Make your way over to the Third Canton, dealing with any looters you find. Go through the Third Canton. Looters are not a problem in this area, but the falling rocks are. Retrieve the Blessing Stone and go directly back to Vivec's Chambers. Inside Vivec's Chambers, talk to Canon Llevule again. "Were you able to get another Blessing Stone? We need to restore some of Lord Vivec's energy before the moonlet falls out of the sky!" I retrieved the Blessing Stone. "Perfect! I can feel Lord Vivec's essence inside it! I hope I remember how to do this. You'd better stand back-just in case." Canon Llevule will place the Blessing Stone in a port in the floor (the same one you used for Sunna'rah in the last quest). It will shoot a beam of energy into the floating form of Vivec. He will remark on the "sweet energy". Once this is done, speak to Canon Llevule. "Oh, thank the Three! Lord Vivec looks better already. Of course, the Blessing Stone is only a temporary measure. We still need to determine what to do about Barbas and the stolen energy." I'm ready to do whatever I can. "As Lord Vivec has written, "the bravest heart never falters." You are truly Vivec's champion. I didn't know if the Blessing Stone was going to work, but I appreciate your help. Now go and talk to Lord Vivec. I'm sure he has a plan to share with us." This completes the quest. Speaking to Lord Vivec at this point starts Divine Restoration. Canon Llevule suggested that we retrieve another Blessing Stone from the construction site so that Vivec can use it to restore some of his stolen energy. I need to find the Overseer to get the stone. The Overseer raced into the construction site to chase after looters. I need to find her to get the Blessing Stone for Lord Vivec. Besides, the Overseer might need help against the looters. Now that the looters have been dealt with, I need to talk to Overseer Shiralas and see about getting another Blessing Stone. I need to use the key and enter the sealed portion of the construction site where the third canton is being built. Then I can retrieve the remaining Blessing Stone for Lord Vivec. I collected the Blessing Stone. Now I need to return to Canon Llevule and Lord Vivec. Now I need to see if Canon Llevule can use the Blessing Stone to restore at least a little of Lord Vivec's energy. Finishes quest The boost of energy from the Blessing Stone seems to have helped Lord Vivec, at least a little. I should talk to Canon Llevule and see if there's anything else we need to do before I try to track down Barbas. This page was last modified on 20 August 2017, at 02:07.